This study examines whether pars plana vitrectomy (PPV) can achieve a high rate of reattachment in primary rhegmatogenous retinal detachments (RRDs) caused by inferior breaks in phakic eyes. Patients with primary, phakic RRD with inferior retinal breaks repaired by PPV, endolaser, and gas tamponade between January 2012 and December 2016 were included. Twenty-six eyes from 26 patients were included. Mean patient age was 61.7 years (range: 38 years to 82 years). Thirteen RRDs were macula-involving, with an average of 2.00 ± 0.70 quadrants and 2.50 ± 2.00 breaks. Twenty-three of 26 eyes (88.5%) were attached at postoperative month (POM) 3. Mean logMAR visual acuity was 0.72 ± 0.84 at baseline, 0.65 ± 0.44 at POM 3, 0.44 ± 0.50 at POM 12, and 0.43 ± 0.36 at the final visit. Single-surgery success rate of phakic RRD caused by inferior breaks repaired by PPV is high. Therefore, the literature is limited on the topic of PPV without SB in phakic eyes with primary RRD caused by inferior breaks. This study examines whether PPV without SB can achieve a high rate of reattachment in primary RRD caused by inferior retinal breaks in phakic eyes. We retrospectively reviewed the medical records of surgeries by CDR between January 1, 2012, and December 31, 2016, at Mid-Atlantic Retina / Wills Eye Hospital. Patients with primary, phakic RRD with inferior flap breaks and a posterior vitreous detachment (PVD) repaired by pars plana vitrectomy (PPV), endolaser, and gas tamponade were included in this consecutive, single-surgeon series. Causative breaks were defined as those occurring between 4-o'clock and 8-o'clock within the detached retina and determined responsible for the RRD. It was the surgeon's routine over this study time frame to repair PVD-related primary RRD with PPV alone and non-PVD detachments with SB alone, but not to combine PPV with SB for any primary PPV. Patients with prior retinal surgery including PPV, SB, and pneumatic retinopexy were excluded. Patients with proliferative vitreoretinopathy (PVR) were excluded. The study was approved by the institutional review board, was HIPAA-compliant, and all the study procedures adhered to the tenets of the Declaration of Helsinki. All surgeries were performed by CDR according to his usual standard of practice. Sclerotomy cannulas were typically placed near the horizontal meridian to help access the inferior vitreous base and breaks. Complete vitrectomy with scleral depression was performed via non-contact widefield viewing. All breaks were marked with diathermy. Primary breaks were enlarged anteriorly to relieve traction on the break and maximize drainage. A complete fluid-air exchange was performed. The technique for drainage of subretinal fluid (SRF) varied by case and included direct extrusion of SRF through the pre-existing break(s), posterior retinotomy, and through pre-existing break(s) via perfluorocarbon liquid. All breaks / lattice degeneration / suspicious areas were surrounded by laser; 360° laser or scatter laser were not performed. The air, in turn, was exchanged with either 20% sulfahexafluoride (SF6) or 12% perfluoropropane (C3F8) gas. The main outcome measure for this study was single-surgery success rate at postoperative month (POM) 3. Secondary outcomes included 12-month single-surgery success rate, final reattachment success rate, final postoperative visual acuity (VA) and factors associated with initial surgical failure. Data analysis was performed using SPSS version 24 (SPSS, Chicago, IL). Before and after measurements of continuous variables were evaluated using the paired t-test. Comparison of continuous variables between independent categories were evaluated using the independent t-test. Twenty-six eyes from 26 patients met study criteria and underwent primary PPV alone for RRD with causative inferior breaks. The mean age of the patients at the time of repair was 61.7 years (range: 38 years to 82 years), with 16 (62%) of the patients being male. Thirteen cases of RRD were macula-involving (50%), with an mean (± standard deviation) of 2.00 ± 0.70 involved quadrants and 2.50 ± 2.00 breaks within the detachment. Twenty-three eyes (88.5%) had C3F8 gas tamponade and the remaining three eyes (11.5%) had SF6 gas tamponade (Table 1). Mean follow-up was 15.9 months (range: 3 months to 42 months). No intraoperative complications or surgical adverse events were noted. Twenty-three of 26 eyes (88.5%) remained attached at postoperative month (POM) 3 after one surgery. Thirteen of 16 eyes (81.3%) remained attached at POM 12 after one surgery. Of the three patients who detached, one had a giant retinal tear (GRT) that opened and two developed PVR. The first patient was a 38-year-old man who presented with a macula-sparing RRD (PVD present) with an inferior GRT associated with three quadrants of SRF. SRF was drained with perfluorocarbon and C3F8 gas was used. At POM 2, the GRT reopened and the patient underwent another PPV with SO instillation, which was successful, and sustained complete retinal reattachment after SO removal several months later. The second patient was a 67-year-old woman who presented with a two-quadrant and macula-involving RRD with a single tear inferiorly. After PPV with C3F8 tamponade, the patient re-detached with PVR at POM 1 and underwent an inferior retinectomy with SO tamponade. The patient re-detached again 1 month later and underwent membrane peeling for PVR with SO exchange. Six months from the initial surgery, however, the patient sustained complete reattachment after SO removal. The last patient was a 64-year-old man who also presented with a two-quadrant macula-involving RRD with a single tear inferiorly. After PPV with C3F8 tamponade, the patient re-detached with PVR at 3 weeks and underwent a PPV with SB and SO instillation without further redetachment. SO was successfully removed without redetachment 6 months after the initial surgery. Mean logMAR VA was 0.72 ± 0.84 at baseline, 0.65 ± 0.44 at POM 3, 0.52 ± 0.45 at POM 6, 0.44 ± 0.50 at POM 12, and 0.43 ± 0.36 at the final visit (P = .12) (Figure 1). 4% of eyes had cataract surgery by POM 3, 38% by POM 6, and 91% by POM 12. 92% of eyes had cataract surgery by the final visit. Patients with macula-sparing RRDs had significantly better logMAR VA at the final visit (mean: 0.29 ± 0.30) compared to those with macula-involving RRDs (mean: 0.57 ± 0.37; P = .046). 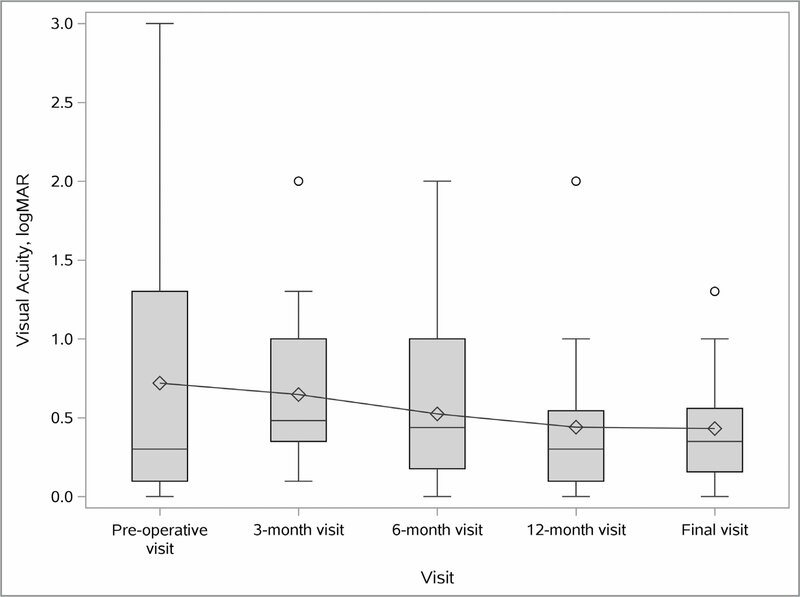 There was a mean improvement from the preoperative visit compared to the final visit in logMAR VA of 0.04 ± 0.66 in the macula-sparing RRD compared with 0.52 ± 1.02 in the macular-involving RRD patients. This difference with regarding to macula status, however, was not significant (P = .19). Boxplot graph of logMAR visual acuity (VA) at baseline, postoperative, and final visits. Inside each box, the central line represents the median, and the diamonds represent the mean. The twenty-fifth and the seventy-fifth percentile are represented by the bottom and top borders of the box, respectively. The bottom and upper whiskers represent the minimum and maximum values, respectively. Circles outside of the whiskers represent the outliers. To the best of our knowledge, this is the first and largest series to examine whether phakic RRD caused by inferior breaks can be repaired by PPV alone (ie, without SB) and still achieve a high rate of success. We found that 88.5% of eyes were fully attached at POM 3 with a single surgery, and all of these eyes remained attached until the final visit with a mean of 16 months. Our single-surgery success rate of 88.5% falls in line with the above studies, despite the fact that our paper included a uniform population of phakic RRD caused by inferior breaks. It might be that these two variables may lead to a slightly lower success rate (eg, 80% success rate in the Goto et al. publication) than a predominantly superior break population like the published report by Schneider et al., though not significantly different. It was previously thought that the addition of a SB to a PPV would help to further support inferior breaks in phakic eyes if unable to relieve traction or ensure adequate gas tamponade. With improved technology, including small-gauge transconjunctival systems and widefield viewing systems, relief of inferior vitreous traction can be achieved in these patients with scleral indentation and shaving. Positioning the sclerotomies close to the horizontal meridian allows for adequate access of the inferior vitreous base in phakic eyes without striking the lens, which did not happen in any eye in our series. Enlarging the breaks anteriorly may also help to ensure relieving traction at the break site in addition to augmenting SRF drainage and allowing for better intraocular gas fill. The findings in this study do not suggest (nor are meant to imply) that SB alone does not have a role in the management of inferior RRD. In younger patients with primary RRD not associated with a PVD, SB alone (without PPV) remains the author's (CDR) procedure of choice. However, for primary RRD with a PVD, PPV alone has become the author's routine. Additionally, a potential confounder in our assessment of VA is the development of a cataract. All our patients were counseled preoperatively about accelerated cataract development following PPV as a known side effect. Cataract removal at the time of RRD repair is not typically performed by the authors unless it prevents adequate visualization and concurrent lens removal was not required in any of the cases in this series. Calculation of logMAR VA in this study revealed a slow and steady improvement through the final visit, more gradual than one would expect from RRD repair alone. This is likely due to cataract progression and then removal as 92% of eyes had cataract surgery before the final visit albeit not at a uniform time point. The logMAR VA improved from the POM 6 visit to the POM 12 visit, likely reflecting cataract progression and removal as only 38% of eyes had cataract surgery by the POM 6 visit, but 91% of eyes had cataract surgery by the POM 12 visit. There are a number of limitations in this study, including its retrospective nature as well as the lack of a control group of pseudophakic RRD or RRD treated with combined procedure. Our series is small and prevented a more thorough analysis of risk factors for redetachment or VA outcomes. However, phakic RRD caused by inferior breaks are less common than those caused by superior breaks as is evidenced by several of the other studies cited in this paper. In conclusion, our single-surgery reattachment success rate of eyes with phakic RRD associated with inferior breaks repaired by PPV alone is high and compares favorably with historic controls of similar cases repaired with PPV combined with SB along with other types of primary RRD, regardless of break location and phakic status. In this context, our study suggest that concurrent SB may be not be necessary on a routine basis for eyes undergoing PPV for primary RRD caused by inferior breaks in phakic eyes. A larger, controlled, prospective study would be necessary to better assess the exact comparative success rate of PPV with SB versus without SB for inferior primary RRD. From Mid-Atlantic Retina, the Retina Service of Wills Eye Hospital, Philadelphia. This material was previously presented in part as a paper presentation at the Annual Retina Society Meeting on October 7, 2017. Funding was provided in part by the Society of Heed Fellows. The funding organization had no role in the design or conduct of this research. Dr. Regillo has received grants from Roche/Genentech, Regeneron, Allergan, Novartis, and Iconic, and is a consultant for Genentech, Alcon, Allergan, Iconic, and Notal Vision. The remaining authors report no relevant financial disclosures. Address correspondence to Carl D. Regillo, MD, Mid Atlantic Retina, The Retina Service of Wills Eye Hospital, 840 Walnut Street, Suite 1020, Philadelphia, PA 19107; email: cregillo@midatlanticretina.com.